‘This is a journey into sound…’ – thus sampled Eric B and Rakim. That’s pretty much the definition of my musical journey thus far. Perhaps because I’ve always been drawn to texture as much as to harmony and melody in music, it was inevitable that I’d end up pursuing an approach to music that put the sonic palette on an equal – or often superior – footing to the notes… The development of my technique was always primarily about tone rather than dexterity. Switching to playing melodies on my fretless bass with the side of my thumb slowed me down a LOT, but gave me the sound I was looking for, so it stuck as my dominant technique. Using the Ebow and the slide, while quirky-looking on stage, result in music that is generally more languid and moved my music further away from the muscular fusion many expected from a solo bassist back in the late 90s. As a result, my gear choices have also been mostly governed by the possibility to broaden, deepen and enrich that same palette of sounds. To give me a broader base of colours to paint with, a greater range of contrasting textures with which to create the layers in my looped improvisations and compositions. Indeed, the very definition of a ‘composition’ for many of my solo pieces was ‘key plus set sequence of sounds’ – they were improvisations as far as the specific notes were concerned, but the sequence of sounds to be layered was way more consistent. The 20 year (thus far) journey into that particular set of priorities has lead to a few interesting outcomes – I’ve mostly had wonderful relationships with the companies whose equipment I use, and have been able to have useful practical input into the development of quite a few unique products and product developments over the years. It has also meant – in combination with the platform my journalistic work gives me – that I punch WAY above my weight in terms of the influence I have over other people’s perceptions of music gear. That’s a responsibility I take very seriously, given the potential for someone to invest an awful lot of money in gear at least partially directed by my own choices. For that reason, I tend to only change my gear when the sound dictates that it be the wisest choice. I’ve avoided paid jobs as ‘the demo guy’ – partly because it’s just not a job I want, but also because they’ve never been offered for the gear I really believe in. I’ve had long standing relationships with a small number of companies that I work with. The one area of my rig that HAS changed the most over the years – and even then only when the music demanded it – is amplification. It’s also, not coincidentally, one of the areas of music gear development that has changed most in the last 15 years. The advent of super light, efficient, powerful, full spectrum bass cabinets, and REALLY great sounding lightweight power amps was a long time coming, but we’re definitely in that age now. I’ve always been fascinated by the conversation about amps, and was for a time pre-occupied with the notion of things being ‘flat’ – I wanted uncoloured sound, just my sound back through a loud lightweight amp. With that in mind, I switched to a high-end pro audio PA set up about 7 years ago, leaving ‘bass’ amps behind for a couple of years. The need for more volume – and the advent of the Markbass combos that I’ve been using for the last few years – brought me back to bass amps, and a sound that was definitely not ‘flat’ but was ‘full range’ and has a tonal imprint I liked. Freed from the tyranny of spec sheets and response graphs, I was able to explore the notion of ‘good’ sound without the interference of notions of ‘correct’ sound. That was helpful. If you’ve seen any of the pictures I’ve posted of late of my rig, or seen me live over the last month or so, you’ll see that I’m now using an Aguilar amp set-up… ‘dude, I thought you really dug the Markbass combos? ?’ said lots of bass players. And I do. They haven’t suddenly stopped sounding good. They’re cool amps that definitely did the job. So how did the Aguilar thing come about? 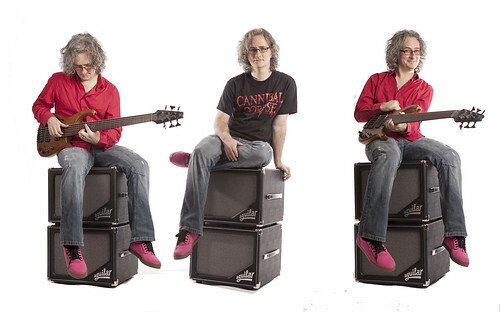 So I arranged to try a rig out – the SL112 cabinets and Tone Hammer 350 heads that I now have. A stereo rig, the same as I’ve had since 2003. I set them up to A/B them with my existing set-up, and was absolutely blown away. I had NO idea they’d sound the way they did. Clear, full, warm, present… just amazing. Exactly what I was looking for. It was very much a case of not knowing that I wanted to change – I hadn’t really felt unhappy with my other system, but on a straight A/B, the suitability for my music was clearly with the Aguilar rig. I ran iTunes through it, to hear what it was like for full-range playback. Added a very slight EQ in my MOTU Ultralight and found that it sounded richer and clearer than even my (admittedly rather cheap) studio monitors. Like a high end 70s Wharfedale hifi. Properly jaw-dropping stuff. This experience was confirmed again and again as friends and colleagues and students got to experience the sound. Wide eyes and big smiles were the unanimous reaction. So I found myself changing amps for the first time in a lot of years. I’ve never been a fan of changing gear for the sake of it, I’ve never tried to deal with frustrations in my playing by getting new toys. It’s only when a clear and obvious choice to move to something that better represents the sound I hear in my head is presented that I’m left having to shift. I’m deeply grateful to Markbass and Markaudio for the many years of great bass sounds (and am still utterly reliant on their MiniDIST overdrive pedal every single time I play), but if you see me playing shows from now on, you’ll perhaps be able to hear why I made the switch to the greatest sounding bass amp I’ve ever played through.